Administrative Announcement: This is my official 1,000th post on Macheesmo. That’s insane and that’s all I’ll say on that. Onto polenta which was the winner of last week’s poll. I’ve made polenta a few different ways over the years and always love it. I’m starting to feel very comfortable serving polenta instead of pasta for some meals. For example, I brought this beautiful Polenta Gratin dish to a dinner party last weekend and the hosts made a delicious venison stew. Normally, I might serve that with egg noodles or just on its own, but man was it good with this polenta. They were made to be together! What I liked about how this dish turned out is that even though it looks like an incredibly rich dish, the polenta is really very light and airy. After being slow cooked and baked, they turn into these little clouds of corn goodness. How could clouds of corn be bad? Serves 8 as a side. 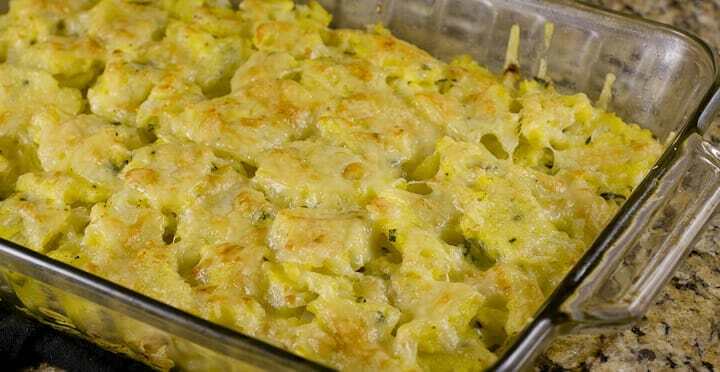 Slow cooked polenta blended with onions and sage is chilled and then baked in gratin form with creamy gruyere cheese. Perfect Comfort Food! 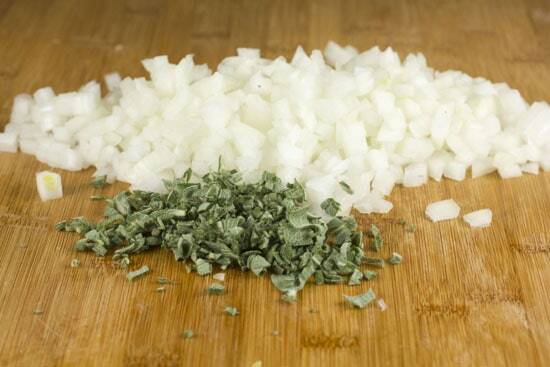 1) Dice and mince onions and sage. In a large skillet saute veggies in butter over medium heat until they soften. Season with a pinch of salt and cook for about 6-8 minutes. You don’t want them browned at all, just softened. Remove from heat and set aside when done. 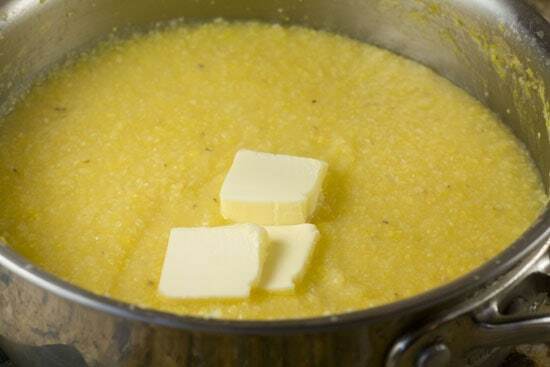 2) Bring 5 cups of water to a simmer and whisk in polenta in a steady, slow stream. Bring to a simmer and stir until the mixture thickens slightly. 3) Turn heat down to very low and cook the polenta for 45-60 minutes, stirring occasionally to make sure it isn’t sticking to the pan. The polenta should be over very low heat so it just bubbles every few seconds. 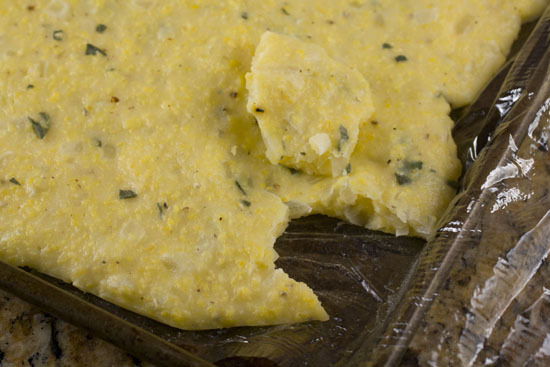 4) Once polenta is thick, stir in onions and sage and a knob of butter. Season with salt and pepper. 5) Line a sheet pan with plastic wrap and pour polenta onto sheet pan. Spread it evenly over the pan. 6) Refrigerate polenta for about an hour until it’s firmly set. 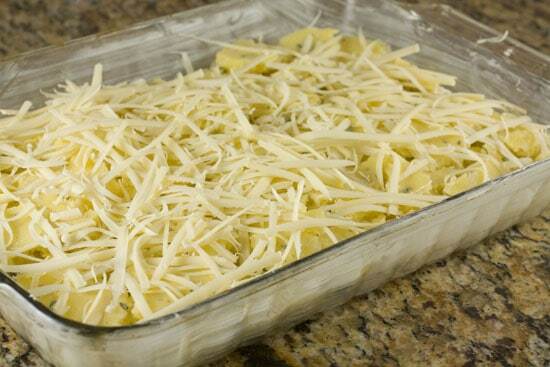 7) Butter or grease a 9×13 baking dish and preheat oven to 350 degrees. 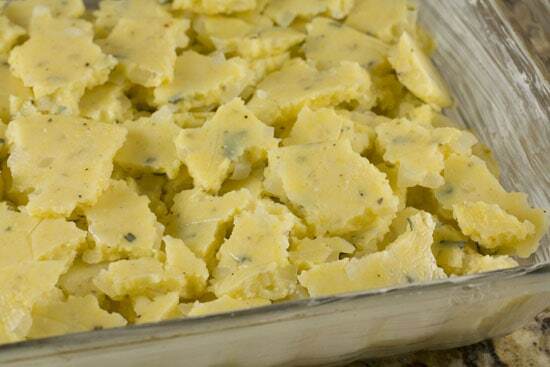 8) Break polenta into 1×1 inch chunks and stack them in the baking dish. Overlap some pieces and stagger them so they are uneven. There should be lots of gaps in between polenta pieces. 9) Add grated cheese to top of polenta. 10) Bake for 30 minutes at 350, then broil on low until the tops of the gratin are slightly browned, about 5-10 more minutes. 11) Let cool briefly and then serve warm. Adapted from The Zuni Cafe Cookbook. I’ve seen a huge range of theories on the correct way to prepare polenta. Some are incredibly fast while some require a bit more time. The preparation that Judy Rogers recommends in The Zuni Cookbook is on the far end of the spectrum. If you followed her recipe step by step it would require many hours to make this dish. Well, to be completely accurate, it would require many additional hours. So I took half of her advice, but not all of it, and I ended up with a very delicious product. I’m getting a bit ahead of myself. To start, you really just need a few simple ingredients. I wanted to get my onions and sage out of the way. These are actually optional. You could make the gratin with just the polenta, but I thought these gave it some really good complexity. Just dice them up pretty evenly. In a large skillet, cook the onions and sage in some butter over medium heat. You want to cook them slowly so they don’t brown but just turn translucent and soft. It’ll take 6-8 minutes to get to the right texture. Just don’t rush them. Once they are soft, you can remove them from the heat until you need them. The big change in this recipe from the other polenta recipes I’ve seen is the polenta to water ratio. Normally, it’s three cups water to each cup of polenta. I’ve even seen 4-to-1. Judy recommends an amazing 5-to-1 ratio though. 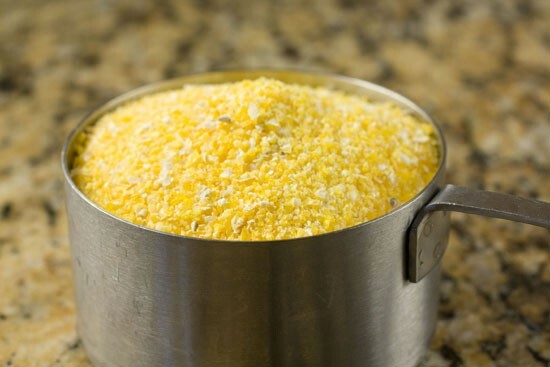 The idea is to cook it very low for a long time with lots of moisture and the corn grains will swell and soften and turn into this almost creamy texture. It takes a bit longer than cooking them quickly, but the results are different and better in my opinion. One cup makes a lot. 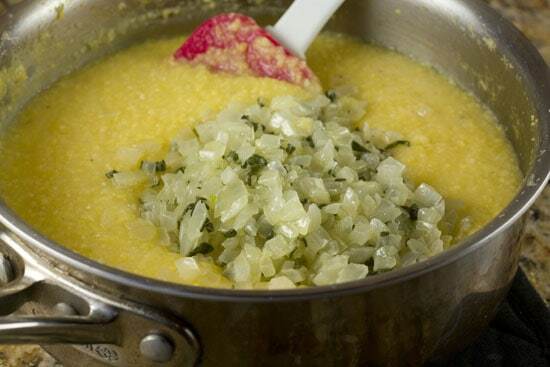 Bring your water to a simmer and then whisk in the polenta in a steady, slow stream. It’s important to whisk the water as you stir in the corn or the grains will stick together immediately. One cup of polenta will look like nothing in five cups of water, but don’t worry. It’ll all get absorbed. Much like risotto, there’s a myth that you need to be constantly stirring polenta while it cooks. That’s true if you’re cooking it quickly over high or even medium heat. The way that Judy recommends though, you only need to stir it occasionally. First, bring your polenta mixture to a slow simmer and then reduce the heat down to very low. The heat should be so low that the polenta only bubbles every few seconds. Since it’s cooking so slowly, you only need to check on it and give it a good stir every 5-10 minutes just to make sure it isn’t sticking to the pan. 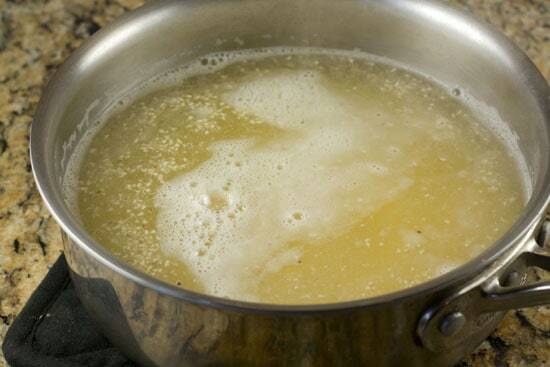 The mixture should always be slightly liquid and never firm. Believe it or not, you may have to actually add more water to the pan if it gets too thick. Cook this at this low temperature for about an hour until it’s creamy, soft, and smooth. Then add in a knob of butter and season it well with salt and pepper. This is where I departed from Judy. She recommends holding the polenta at a low temperature over a water bath for another few hours which will improve the consistency. That might be true and fairly easy to do in a restaurant kitchen, but I didn’t want to spend a whole day making polenta so I just moved ahead with the recipe. It seemed to work out fine. 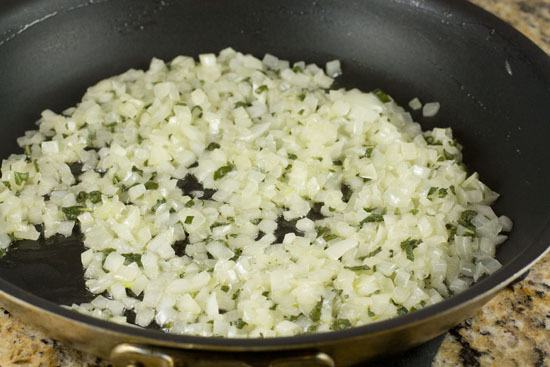 The next step is to stir in those sauteed onions and sage. I love the smell of this. It’s worth noting that you can stop here. 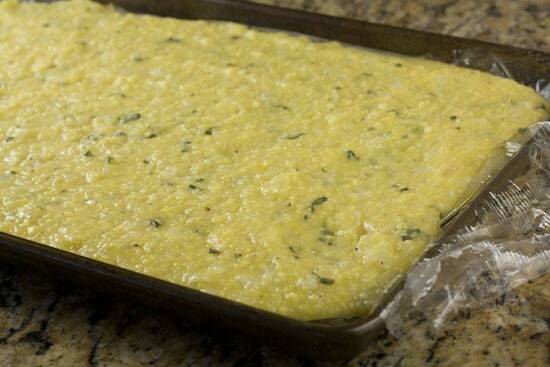 The polenta with onions and sage is delicious as-is. Serve it with some grilled chicken or something and it’s a wonderful meal. But if you want to take it to the next step, line a sheet pan with plastic wrap and then pour the polenta into the sheet pan. Spread it out so it’s nice and even over the pan. Let this cool for a few minutes at room temperature and then stick it in your fridge for 45-60 minutes until it’s nice and firm. Once it’s firm, start breaking the polenta into chunks! Random chunks is better than perfect squares. This Polenta Gratin shouldn’t look like a potato gratin which are so uniform and perfect. This gratin should be craggy and have different shaped pieces. So don’t worry about breaking up the pieces into the same size and don’t cut them into even squares or anything. Just rip them up and throw them in a dish. Speaking of the Polenta Gratin, make sure you butter it well. We call this the rustic look. Cover this with just a light coating of cheese and it’s ready to go. You won’t hear me say this often, but don’t over-do it on the cheese. It should be a very light layer. Bake the Polenta Gratin at 350 degrees for about 30 minutes and then stick it in the broiler (low is best) to brown a bit on top for about 5 minutes. What I love about this Polenta Gratin is that you have some peaks from the polenta that get a bit more browned than other parts so some parts are really crunchy and some pieces are nice and smooth. This is about as good as a winter side dish can get in my opinion. This stuff absolutely disappeared when I made it. I was barely able to get thirds before it was gone. “I was barely able to get thirds before it was gone.”- ha ha! Wow…this looks incredibly delicious, Nick. I don’t cook with polenta enough, so I think I will be a little intimidated to make this. That said, I am going to bookmark this to make soon. I love that you paired this with venison stew. Would you serve this anytime you would serve pasta or potatoes? Thanks! 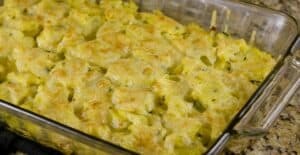 I think you could sub this for almost any time you would serve a starch like pasta or potatoes easily. I’m not sure I would serve it with fish, but other than that any protein would be good with it I think. Especially ones with nice sauces like stews or braises. Happy 1000th Post Day! Keep them coming. We really enjoy Macheesmo! I actually prefer polenta intsead of pasta. VENISON STEW!!! Yum. I challenge you to write a post about venison. Oh yea. It was good. I’ll see what I can do. Venison is pretty easy to come by in Colorado. Just drive around until you find some road side. I will definitely be making this–my kids love grits so it should be a hit around here. And I love that you can essentially make it in advance and throw in the oven before you’re ready to serve. Nick! Congrats on your 1,000th post! Recipe does look amazing! I’ve not used polenta enough – so it’s nice to have a new prep method to try! – Thanks! 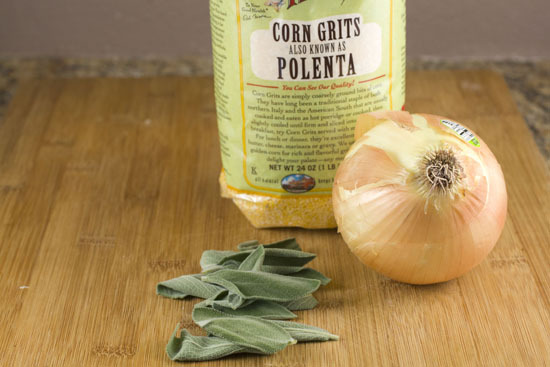 I love Bob’s Red Mill’s polenta corn grits…just recently discovered it! This looks absolutely delicious!! Congrats on 1000 posts…that’s amazing!!! 1000! Very impressive, sir. Keep up the excellent work. This looks amazing! I am definitely going to try this one out. This looks like a winner to me – will try it this weekend. 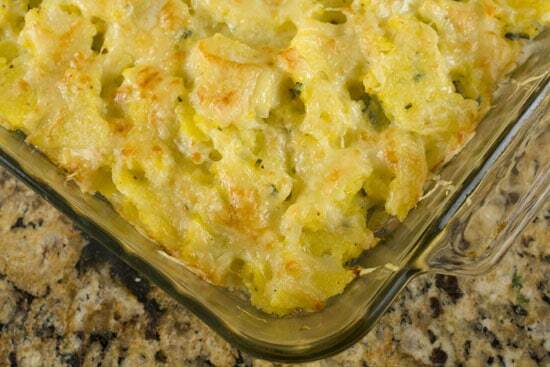 These grits…errr…baked polenta look delicious!